In gymnastics, hand rips from gripping bars are common and repairable. Did you know they are, in many cases avoidable? I will give you tips on how to avoid grip rips. I will also explain how to repair and treat them if you do get these hand rips. Grip rips are part of being a gymnast, but it is important to keep them minimal. Tender loving care will help or possibly prevent these painful hand rips. I want to help you avoid ripping those callused hands. It not only causes pain, but can hinder a performance. Calluses are the hardened or thickened parts of the skin. They are to help protect the area where there is a lot of friction. Calluses are located at the top of the palms and sometimes in the middle of the inside of the hand. The more friction that occurs, the deeper the calluses. If the calluses get too thick, then rips can occur. It is important to avoid hand rips by maintaining proper care. In gymnastics before you see a gymnast start her bar routine, she will rub chalk on her hands. This helps decrease the friction, but it also dries out the hands. The best way to a gymnast can care for her calluses is by shaving them down. Many stores sell callus razors. Pumice stones may also be used. I have even heard of people using podiatric sanders as well. Anything that helps grind down or shave the unwanted layers of the calluses. Do not shave the calluses down too far. 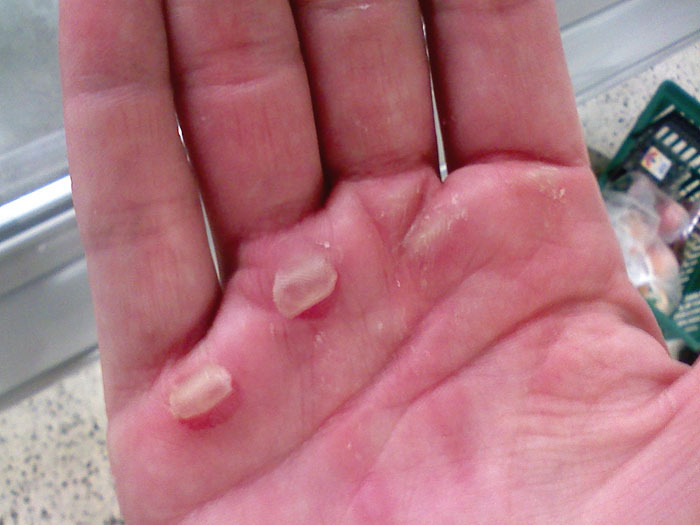 In gymnastics, these calluses are a must have, just don’t let them get too thick. Groom them every week to avoid hand rips. Shaving the layers of a callus will keep excess skin from growing. Also, use a good skin moisturizer. Before bed is a must, Bag Balm is my favorite. Although it moisturizes, it also seems to heal the skin. It is usually found at your local hardware, farm, or drug store. In gymnastics it is important to take care of a hand rip properly and as soon as possible. It must first be cleaned out with an antibacterial type product to keep the wound from getting infected. I recommend using an antibiotic suave just before covering up the wound. There are H shaped bandages that may be used if your gymnastics facility has them in their first aid box. If not, I recommend wrapping gauze and tape around the hand. This is a sure way to keep the wound protected. Wrapping the hand will also help the gymnast to go on with her bar workout. Also, be sure to cut a couple pieces of tape and adhere them from the bandage inside of hand, through the fingers, and attach it to the back of the bandage. Keep the wound covered for 4-5 days. If it is not healed, repeat this process and try to avoid too much friction until it heals.